Index To Section 8A.. A Question of Salvation > Carnal Christians? Carnal Christians... A Contradiction in Terms? This Carnal Christian doctrine is primarily based on an erroneous interpretation of a single passage of Scripture. 1 Corinthians 3:1-4 often used as a proof text for the belief that there are three categories of men.. the Natural man who has not received Christ, the Spiritual man who is led and empowered by the Holy Spirit, and the Carnal man who supposedly is saved, but shows no evidence of change. The Scofield Reference Bible, which gave the teaching both creditability and it’s initial impetus, says.. Since, in this letter, Paul describes the Corinthians as carnal, many have come to the totally flawed conclusion that it is possible for people to come to faith in Christ, but then to proceed to live the rest of their lives with no evidence that they have experienced anything of the power of the gospel in their lives and that they are a new creation. In other words a person, believing that Christ died on the cross for him, has received Him as savior, but lives just like the unsaved, displaying in his (or her) life absolutely no evidence of holiness or any other fruit of the Spirit. They are not new creatures and, for them, old things have not passed away (2 Corinthians 5:17). They act, think and live like non-Christians, which fact alone should give the thinking person pause for thought. However this is not the case… Carnal Christians consider themselves saved, supposedly having Christ in their lives, although not on the throne of their lives… which is the essence of the Carnal Christian Theory." Amazingly, Carnal Christians believe that holiness which, although it might be both admirable and commendable, is not essential to salvation, and depends not on the commands of the Lord, but on the spiritual inclinations of the individual. They believe that they can have their cake and eat it too... living as they want in this world, then scrape through the Pearly Gates by the skin of their teeth. Although they will possibly lose some blessing in their present lives and certainly rewards in the kingdom to come, they will at least be there for all eternity. They are as secure as the Spiritual Christian. So the question has to be asked… Is there such a thing as a Carnal Christian or is this merely a ghastly contradiction in terms. The topic of the Carnal Christian is no different, ignoring as it does both Scripture and common sense, both of which happen to go hand in hand which, I admit, is probably a radical concept for many. Lets start with the very heart of the Gospel.. Salvation, or the fact of being saved, which is where the common sense bit really kicks in. "… for He will save His people from their sins." So the angel said that Jesus would save His people from sin, but the Carnal Christian think he will be saved in sin. When push comes to shove, I think I will take the word of the angel any day. Besides which Isaiah 59:2 expressly states sin is the root cause of our separation from God..
"But your iniquities have separated you from your God; and your sins have hidden His face from you, so that he will not hear". "For the wages of sin is death; but the gift of God is eternal life in Jesus Christ our Lord". Bottom line? Our sins, which have separated us from God, merit the death penalty. However Christ died on the cross to save us from these very sins. If we had never sinned we would not have any fear of being sent to hell and certainly would not have needed a redeemer. Besides which, salvation involves more than simply affirming in one’s mind that Jesus is Lord and Savior. The modern day perversion of every aspect of the Gospel would lead us to believe a person is saved based solely on the fact that he has made a ‘decision’, walked an aisle, made a profession of faith, or asked Jesus to come into his heart. However Biblical salvation takes genuine repentance, which the Bible presents as being connected to salvation. While repentance is not something we do to earn salvation, without repentance there is no salvation, according to virtually everyone in the New Testament … John the Baptist, Jesus Himself and all the disciples… that is of course if their testimony counts for anything. [See Repentance.. the Missing Message and Why NOT To Ask Jesus Into Your Heart]. "For sin shall not have dominion over you. Know ye not that to whom ye yield yourselves as servants to obey, his servants ye are to whom ye obey: whether of sin unto death, or of obedience unto righteousness? . . . Being then made free from sin, ye became the servants of righteousness" (Romans 6:14, 16, 18). Over and over again, the Bible divides men into two groups... the saved and the lost, the believer and the unbeliever, the sheep and the goats, the children of darkness and the children of light, etc. It is black and white, without even a suggestion of people having all the characteristics of people in the first group, yet all the benefits and blessings of those in the second. Note however, that none of this implies that Christians do not ever sin. As long as we are in our present bodies, sin will continue to be something we do daily battle with. As Galatians 5:17 describes it.. "the flesh lusteth against the Spirit". Every Christian is carnal in some area of his life and his growth in Holiness is far from a smooth and easy ride. There are hills and plateaus, obstacles to be overcome and mountains to be scaled. However, through it all, the one thing that Christians do not do is deliberately and habitually sin. The Spirit has become the governing force in the born again Christian. On the other hand the term Carnal Christian implies a habitual state of carnality. So then what about the passage in Corinthians that so specifically talks about Carnal Christians. The church of Corinth is commonly cited as proof that even Carnal Christians are saved and on their way to heaven. The primary passages in question are..
'But the natural man receiveth not the things of the Spirit of God: for they are foolishness unto him: neither can he know them, because they are spiritually discerned. But he that is spiritual judgeth all things, yet he himself is judged of no man' (1 Corinthians 2:14-15). Under the term natural the Apostle includes all those persons who are not partakers of the Spirit of God. If the Spirit of God has not given to them a new and higher nature then they remain what they are by their natural birth, namely, natural men. 'If any man be in Christ, he is a new creature', and for all who are 'in Christ' it is also true that, 'old things are passed away; behold, all things are become new' (2 Corinthians 5:17). In short.. All Paul is saying in 1 Corinthians 3:1-4 is that, in some areas of their lives, Christians can and do sometimes act like the unconverted. It is worthwhile at this point to examine why Paul was chiding the church at Corinth and why he referred to them as carnal. There are two very significant points about the above verses, which if paid attention to, throw a great deal of light on the matter. 1) The sins listed are not merely examples of immaturity and/or carnality, but will exclude a person from the kingdom altogether if not repented of and forsaken! Note that Paul begins this passage on the unrighteous by saying "know ye not?" In essence he was saying that they should already should have had a firm grasp on this spiritual truth, and it was a sad indictment that they didn't. Sadly, many today still "don't get” that the fate of the unrighteous is that of exclusion from the kingdom of God. 2) However Paul did not use the present tense and say ‘such are some of you’. It is obvious that some of the Corinthians had been guilty of the sins mentioned, but had since become Christians... washed, sanctified, and justified. James 1:14 But every man is tempted, when he is drawn away of his own lust, and enticed. 1:15 Then when lust hath conceived, it bringeth forth sin: and sin, when it is finished, bringeth forth death. Notice that first it starts with temptation- then the temptation is meditated upon and gives birth to iniquity. James uses the terminology of "conception" (like getting pregnant with the sin). Then finally, the sin is "finished" or actually carried out by the body-thereby causing and bringing forth death. Paul, by the Holy Spirit, was warning the immature carnal Christians at Corinth that if they did not abandon their selfish/carnal ways, they could degenerate into that class of people called the unrighteous. 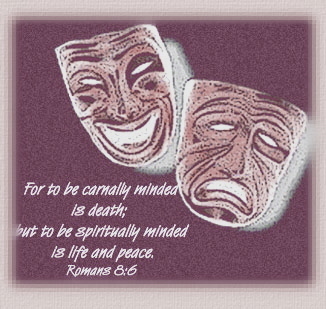 Lest anyone should think that being carnal is a place of safety- let me remind you of this verse in Romans. Scofield Reference Bible, pp. 1213, 1214.